And you thought that Apple shoppers had no budget. That infamous and adored iPad is on sale, and people are snapping up the cheap ones. 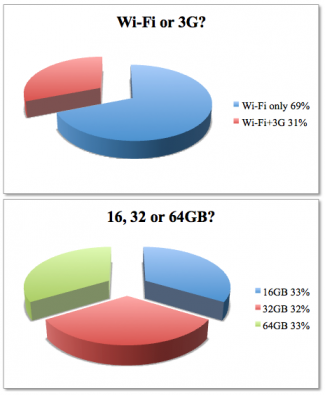 Data collected by AAPL Sanity [via] outlines the orders of iPads thus far: more than two-thirds WiFi only, and an even split among the storage options. To be certain, this data is not perfect, but it is certainly illuminating. We have included the pertinent graphs at right. When the iPad was announced, many in the world of technology suspected that most purchasers were going to skew towards the higher capacity and 3G versions of the gadget. After all, if you can afford a third computer (in between your smartphone and PC), you can tack on a few extra dollars to at least get the 32 gigabyte option, right? If you contemplate for a second on the data, you will at first notice what few top-price iPads are being sold. The 3G version is most costly, as is the 64 gigabyte option. Looking at the percentages, we can expect one-third (33%) of 3G iPads to have the highest capacity, meaning that one third of 31% of iPads are the top-level. What does that work out to? 10.23% according to my little calculator application. Flip it around and go the other direction. We can against expect one third of the WiFi only gadgets to be the lowest capacity, 16 gigabytes. Do the math again, 33% of 69% is 22.77%. That means that nearly one-fourth of all iPads sold are the dead lowest tier. While this might show broad consumer demand for the device, it is hardly heartening to Apple that so many people are selecting the cheapest iPad. More than twice the percentage that are selecting the highest priced (and most capable) iPad. What is the price differential between the two? A grand total of $330, or some 66% of the cost of the cheapest iPad (at $499). Long live cheapskates looking to use cloud based services and their home WiFi to dodge the more expensive SKUs.